To approximately half our Canadian readers, Happy Simcoe Day, Happy Colonel By Day, Happy British Columbia Day, Happy Natal Day, Happy Nunavut Civic Holiday or Happy whatever this August Monday is known as in your neck of the woods. For those who don't have today off, well, neither do I. I'm returned to the land of the free-ish tonight, Monday, on "Tucker Carlson Tonight" live across America at 8pm Eastern/5pm Pacific – with a rerun at 12 midnight Eastern. I hope you'll dial us up - and stay tuned for a full week of me on TV and radio in the days ahead. ~The funky Chinamen just got funkier: A few years ago a guy was arrested on oldies night at an Isle of Wight pub for the hate crime of singing "Kung Fu Fighting". And ever since, as you'll know if you've seen me on stage in Australia, Canada or Mansfield, Ohio in recent years, I've taken to performing the classic Seventies hit as the unlikely hill for western civilization to die on. (Approximately half the Aussie cabinet have been exposed to my rendition of the number.) Because, if "There were funky Chinamen from funky Chinatown" is a crime, then nothing is not a crime. 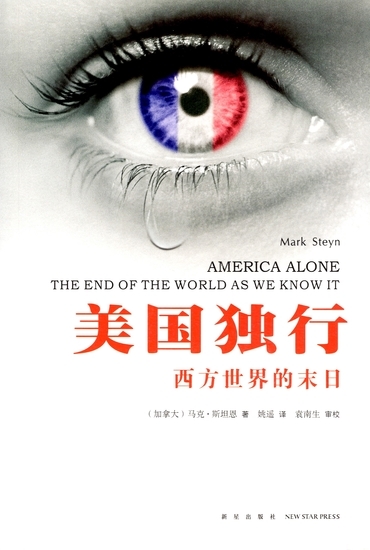 I'm not sure if funky Chinatown has a funky bookstore, but, if it has, be sure to swing by and pick up the brand new Chinese edition of my enduring bestseller America Alone: The End of the World as We Know It. I've no idea why it has a French tricolor eyeball on the cover (top right), but I'm sure there are good reasons - and perhaps some of our many readers in Hong Kong, Shanghai and Beijing will enlighten us. 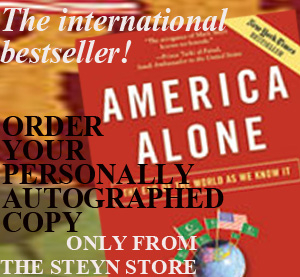 And don't forget that personally autographed copies of the original are exclusively available from the SteynOnline bookstore. Does the name Ruthann Friedman ring any bells? I assume not, but like eden ahbez, she was the composer of a monster #1 hit, and to the best of my knowledge, never wrote anything else that charted at all. I'll give you a couple of hints: Like "99 Miles From L.A," there are no rhymes in the verses, but one massive triple-rhyme in the bridge. Also of interest to you, one of the two lead vocalists hails from New Hampshire. It topped the charts for four weeks until it was finally superseded by "Light My Fire." Give up? Click here. Do click on Dan's link - I had a phase in my disc-jockey days where I was very partial to that record. Latterly, alas, whenever I find myself singing it, I realize by the middle section that I've somehow segued into a devastating Rush Limbaugh parody thereof. However, I'm truly grateful to our Californian correspondent for reminding me of '99 Miles from LA", which is a great song - although Dan may be disturbed to hear that my very favorite version of it is by Johnny Mathis. In a six-decade career in which he's taken a crack very credibly at almost everything, "99 Miles from LA" is one of Mathis' very best - and I'm always a wee bit disappointed if I go to hear Johnny in concert and he doesn't do it. The song was written by Albert Hammond, Gibraltar's finest (not sure where he stands on Brexit), and Hal David, who also wrote "24 Hours from Tulsa". I once had a vague idea for a medley of the two numbers as "99 Hours from Tulsa" and "24 Miles from LA". 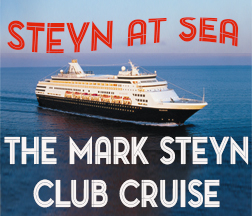 ~Our upcoming inaugural Mark Steyn Club Cruise from Montreal to Boston is fast approaching. 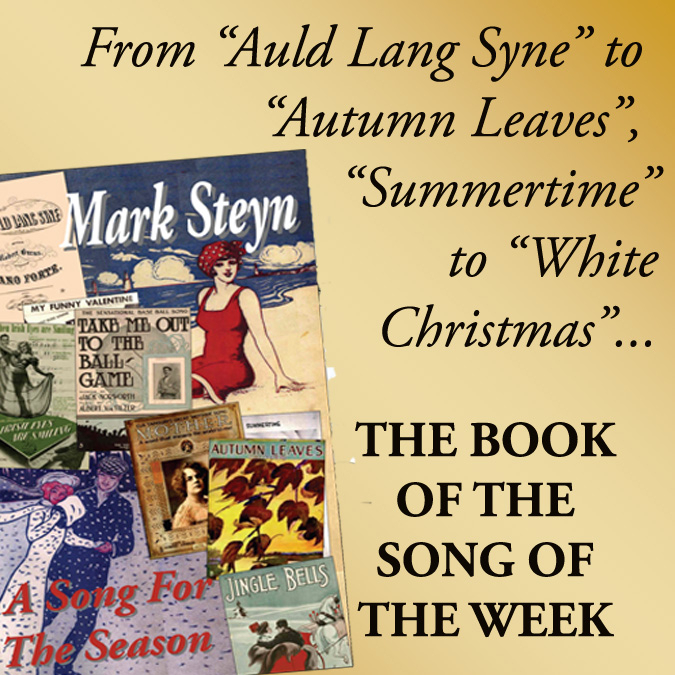 We hope you'll want to join me and my doughty crew Michele Bachmann, John O'Sullivan, Phelim McAleer and Ann McIlhenney, plus special musical guest Tal Bachman, as we attempt some seaboard versions of The Mark Steyn Show, Tales for Our Time, our Sunday Poem and other favorite features. If you're thinking of joining us, don't leave it too late, as the price is more favorable the earlier you book. 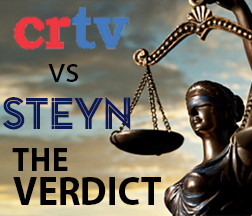 ~We had a busy weekend at SteynOnline, starting with a Topical Take on Zimbabwe's first post-Mugabe election. Our guest film programmer Kathy Shaidle concluded her series of summer movie picks with Rita Hayworth in Gilda, and our Song of the Week told the story of a strange enchanted boy, who wrote a strange enchanted song. If you were too busy with Simcoe Day preparations, we hope you'll want to check out one or two of the foregoing. 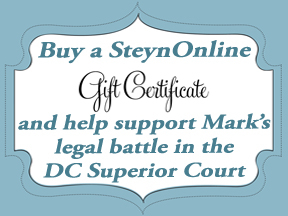 Thank you so much for all the Mark Steyn Club subscription renewals over these past few weeks. As our second year cranks into top gear with our inaugural Club Cruise and more, I know very well that I would not have survived the last hellish eighteen months without the support of our members around the world. For more information on the Steyn Club, see here - and don't forget our limited-time Gift Membership. Catch you on the telly tonight with Tucker live across America at 8pm Eastern/5pm Pacific. It is wonderful to have you back, Mark. You killed it on Tucker last night. I loved your response to that open borders lunatic in Arizona: "'Imagine a world where anybody can enter from Mexico.' There's a name for that world. It's Mexico!" Absolutely spot on. It might just have been the slightly trimmer beard, but I have to say that you looked healthy and well-rested too, and I sincerely hope that is indeed the case. Oh, and by the way, Kathy did a terrific job holding down the fort here, as did the person (team?) behind the scenes who is responsible for managing your website. Hats off to them. 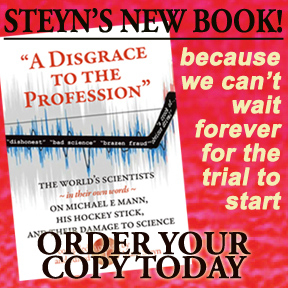 The one and only Mark Steyn is back and better than ever! And not a day too soon. Breaking story here in my beautiful state of New Mexico: some radical Muslims in some encampment kidnapping children. It's just another day in Progressives' Paradise! We need that wall, National IDs, everything. There is no place to go when they start kidnapping the children. Just a dang minute now. Hold on folks. 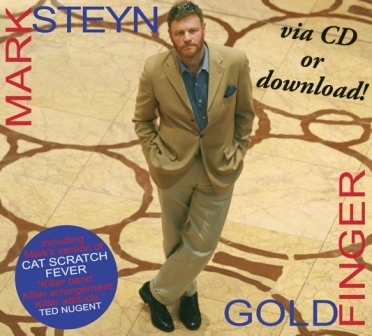 How do we know this guy is the real Mark Steyn? 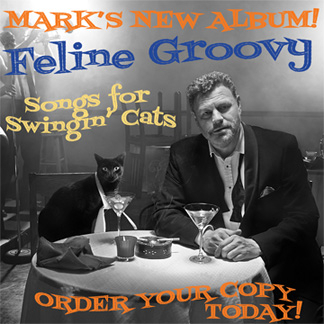 Hair looks different, beard looks different, and that tie.... would the real Mark Steyn wear that awful tie? I remember when Paul McCartney died and they tried to foist that look-alike off on us. That guy's still running around claiming to be Paul McCartney! I'd be wary of this "new" Mark, people. Do we have a retinal scanner here in the club? 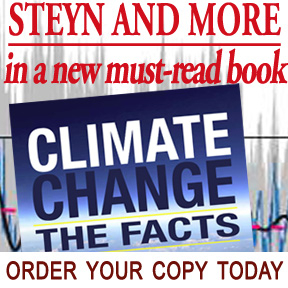 The earth has tilted-back to normal: Steyn reigns. Hi Robert, you got me pumped to go see this new Dinesh D'Souza film tonight. "Death of a Nation" should be seen by a few million Americans times ten. It was a real eye-opener. I invited a friend who was a former American History teacher at a nearby community college to come along to the theater. I turned to her a few times and whispered that something or other Dinesh spoke about was new to me especially the part about FDR and Mussolini. She said she taught this, all of this, but unfortunately she lost her job because she believes the word might have reached the administration that she was very conservative and teaching the truth about Democrats in our country's history and the big lie they have used for the last century and longer to control the thinking of the population and to swing voters to their side. Political correctness is the new stick, and it hides the fascist nature of their goals to remake our nation. They can never be in positions of power again or we will lose our country as Germany lost theirs to the Nazis and their fascist agenda. 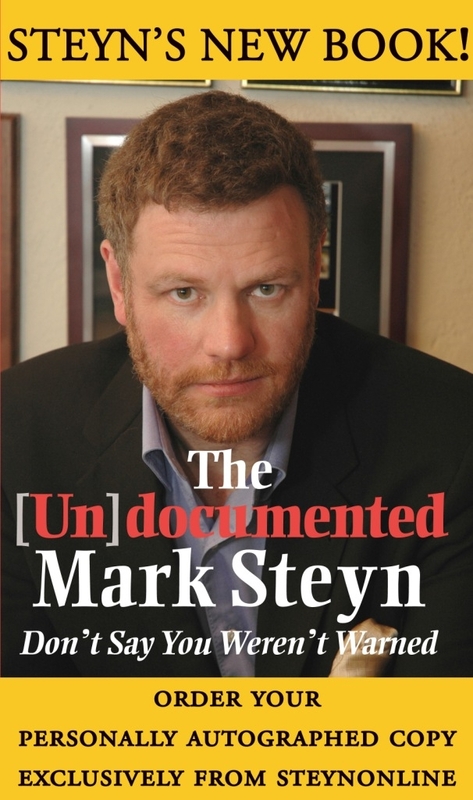 I didn't know there was going to be a clip of Mark Steyn shown. I would see the film again in a minute. It was well done. Mark, anyone (especially Canadians), did you watch Turn on AMC? What did you think of John Simcoe's depiction on that series. Wow! That break was good for you. You were looking really well on Tucker - has the beard gone or is it just designer fluff now? Woo-hoo! As they say in cultivated circles these days! He HAS returned. He said he would. And as the title here suggests, I hope he's "ridin' the range once more, totin' his old .44!" And bein' that that's "the most powerful handgun in the world, and would blow your head clean off..." the punks of the world have gotta ask themselves one question: "Do we feel lucky?" And our long international nightmare is finally over! It would seem that the Fortress of Solitude has once more been left to its own devices. I suppose the modern day equivalent of the phone booth is the green room. So if that's the French tricolor I guess you're the Crepe Crusader. Looking forward to upcoming articles. Despite having had more than my share on the occasional night out over the years, this remains the only club I ever really got engaged in. Speaking of water wars (Chinatown) I have figured the effect of Trump stirring up so much trouble within the press would eventually lead the press to calm down, here and there. With the annual burning of the state underway in California, Trump Tweeted today that the fires wouldn't be as bad if California environmental regulations would allow for proper management of water instead of wasting it to the ocean. He's right about California water policy being bad for the state, but I don't know what that has to do with the fires. The press doesn't know either, and for a change has (in unison of course) shelved its apoplexy and run with a straightforward story that no one knows what he means. When the Three Gorges Dam was completed, a Chinese official said it was the largest project China had completed in several thousand years, providing perspective on the long game China can play. Sometimes Trump seems to start a battle to confuse the opposition about where the real battle is. But I'm not sure the real battles always get waged. Why he is seeming to go head-to-head in a tariff war is unclear. Why not conduct the campaign on something about which China is clearly in the wrong, such as its massive nationwide intellectual property and copyright theft? The Chinese Communist Party point of view of Mark's prescient book presumably would be, "America Alone in Our Crosshairs". Counterfeiting is so widespread in China that it is contributing "big-league" to our trade deficit, a more legitimate grievance than some of the others. Trump criticized Angela Merkel for her gas-pipeline deal with Russia on the basis of funding the enemy. How much greater is the trading-in of our manufacturing capacity and giveaway of intellectual property to fund our enemy's military build-up? "Gibraltar's finest"? Albert Hammond has certainly penned some fine songs in his time (I'm rather partial to "It Never Rains in Southern California", although as an insight into climate it ranks up there with the Hockey Stick); but can the world really forgive him for "Gimme Dat Ding"? It's like Ray Bradbury's story The Day It Rained Forever". For the longest time, the rain's forgotten and it feels like it'll never rain again, and then, "Man, it pours." Welcome back. It's more chaotic than ever. We need your commentary. When Rush is not around, I very much enjoy Mark as his guest. When Mark is not around, I very much enjoy Kathy Shaidle as movie reviewer. Thanks to you both. Edmond, that means a lot to me. Thank you so much! I've been recommending Mark's seminal work 'America Alone' for 12 years now and if you watched Tucker's stomach turning interview with Tommy Robinson last week you see just how prescient this great book was. Robinson's treatment was a crime against humanity and was totally ignored in our media and in Europe. Given the great success of Islamophobia here in America was Mark's frightening title actually too optimistic? Great to have you back in action Mark. In my neck of the woods, it's happy Return of Mark Day. Mark's absence has allowed me to dive into Dickens' "Martin Chuzzlewit" with wonderous success. Previous attempts to devour said work have ended badly with the would-be reader encountering heavy chewing in the early chapters, leading directly to severe chocking, rendering the partially a digested pulp and untouched weighty chapters of the volume to spew and plummet on slender unprotected toes, regardless of whether they went to market, had roast beef, or stayed home; these delicate feet and my emotional constitution being both sensitive, we suffered a double injury both bodily and of character, as the truth became an implausible cause for the injury and an endless source of embarrassing speculation from those near and somewhat less dear. Horray! "Ginger" is back on the island with us, and that mysterious tom-tom music is playing in the background. Good to have you back. I have enjoyed reading you for years. I noticed the the French tricolor look as well, as then I figured it is red, white, and blue and therefore probably considered close enough (cha bu duo, in Chinese). One other note. The Chinese title is actually about the last day or days of the Western world--not the whole world. Perhaps that is wishful thinking. Spread the word around, guess who's back in town. Glad to have you back, Mark! Looking forward to new thoughts from both of you. What an eye-catching book cover, and welcome back! 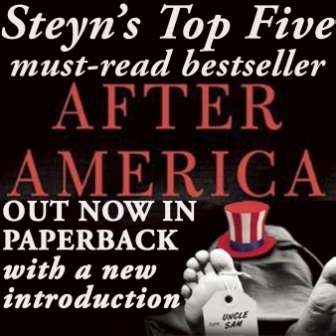 Welcome back, Mr. Steyn. You were sorely missed. 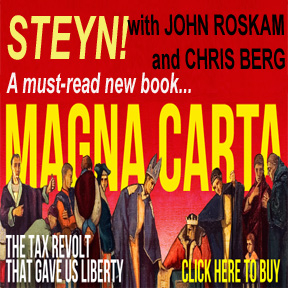 A big thank you to Mark Steyn for inviting me to write about movies in his absence, and to everyone else for reading my stuff, and adding their gracious comments. Hope to thank some of you in person on the cruise! Welcome back Mark. So great to hear your voice in my head as I read your words. We missed you.